‘Twas the day before Christmas and all through the yard the Cat in the Hat and his guests partied hard. When the party was over, and the guests all departed one poor baby reindeer was left broken-hearted! Can the Cat in the Hat, Sally, Nick and the Fish help make come true little Ralph’s Christmas wish? to be with his family, in far-off Freeze-Your-Knees. Will you help see him home? Come be our guests, please! KIDS FIRST! Film Critic Damon F. comments, “I like how the animations in this movie looks exactly like the illustrations in the original book. In the movie they show tons of characters from the books celebrating Christmas in their own way with The Cat in the Hat. 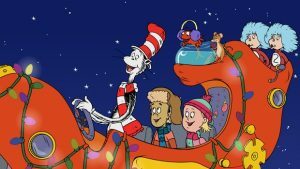 This teaches kids about different holiday traditions.” Denise B. adds, “This is a great addition to the other Cat In The Hat Knows A Lot About That shows. Like the others, it features Martin Short as the voice for the Cat, is colorfully animated, has very catchy music and is just fun to watch.” See their full reviews below. Damon F., Age 10 KIDS FIRST! 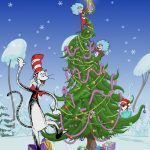 The Cat in the Hat Knows A lot about Christmas is an animated film based on the classic book, The Cat in the Hat by Dr Seuss. The movie takes place on the night of Christmas Eve. This film is a Christmas special from the TV show The Cat in the Hat knows A lot about That. This is an educational show where The Cat explains nature and science by going on adventures with two kids named Sally and Nick. The Cat in the Hat Knows A lot about Christmas is about when the Cat in the Hat (Martin Short) and his friends must try to take a playful reindeer named Ralph back to “Freeze Your Knees Snowland”, for Christmas. I like how the animations in this movie look exactly like the illustrations in the original book. In the movie, they show tons of characters from the books celebrating Christmas in their own way with The Cat in the Hat. This teaches kids about different holiday traditions. The Cat’s animal friends each show their way of migration and use it to help The Cat bring Ralph home. This makes the movie very educational. For example, when they meet up with some dolphins the dolphins work with Ralph to bring the thingamajigger back to land. This shows how dolphins always work together to complete any task. My favorite character in this movie is Ralph the reindeer (Annick Obonsawin) because he is very relatable and tries to always be the best at everything. There is a running joke in this film which is very funny. The joke is that every single time there is a problem, The Cat calls for Thing 1 and Thing 2 (Rob Tinkler). 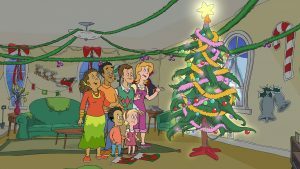 When they come out of the thingamajigger, they are ready to set up an entire Christmas celebration wherever they are but every time, one of the kids, Sally (Alexa Torrington) or Nick (Jacob Ewaniuk) comes up with a reason to not do it. This makes them very sad. The message of this movie is that the meaning of Christmas is being with your family and friends. I rate this movie 3 out of 5 stars and recommend it for ages 3 to 7 because it is funny and repetitive, and the characters are familiar. It is also educational. This movie is available on DVD now. Looking for an original family fun DVD to watch with the younger kids during the Holiday Season? The Cat In The Hat Knows A Lot About Christmas is the one to watch. This is a great addition to the other Cat In The Hat Knows A Lot About That shows. Like the others, it features Martin Short as the voice for the Cat, is colorfully animated, has very catchy music and is just fun to watch. It starts out at the Cat’s big Christmas party with all his various creature friends, from elephants to a very little mouse. We learn that a caribou is the same as a reindeer. There is a delightful story about finding Ralph the Caribou and taking him home for Christmas. I highly recommend this for children ages 3 to 8, and their parents too. I give it 5 stars out of 5 for its terrific entertainment value. Reviewed by Denise A. B., KIDS FIRST! Adult Juror.